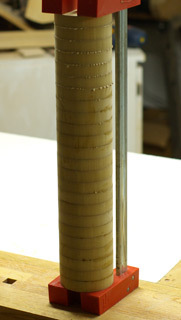 The drum is built on a 5/8 inch keyed shaft with 3-1/2 inch diameter MDF discs 3/4 inch thick. About every fourth disc I cut a keyway on the scroll saw and used a hardwood key with the grain running across the connection. The first disc is about 2 inches from the end of the shaft. I did the glueup in stages to make sure there was good contact at each disc, and inserting the keys is a bit finnicky so open time is a factor as well. Bench dog holes make a handy spot for the shaft to go while you're assembling. 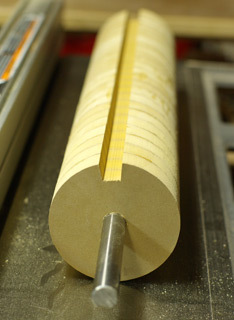 We need a slot cut the length of the drum so we can attach the paper. A simple jig consisting of two lengths of wood and two four inch wide blocks between them does the job. 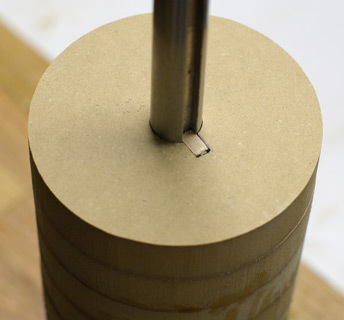 Drill a 5/8" through-hole centered and two inches up in the blocks and assemble with screws with the drum installed. I let the side boards run long at the back end to give better registration to the TS fence at the end of the cut. 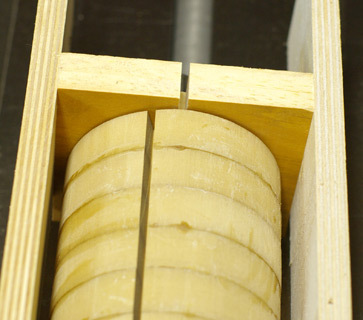 A single short screw at one end prevents the drum from rotating. Now set the TS fence so that the cut is inline with the center of the drum, it doesn't need to be perfect. Blade height around 3/4 inch to give us about a 1/2 inch deep cut in the drum. 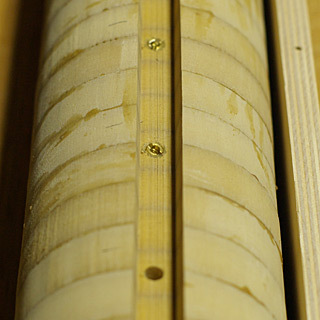 Remove the screw in the end preventing rotation and rotate the drum so that the next cut will make for an approximately 5/8 inch total width of the slot, using the kerf in the end boards as a reference. You'll be making the wedges to fit the groove so the exact dimensions are unimportant, but it must be at least 1/2 inch. 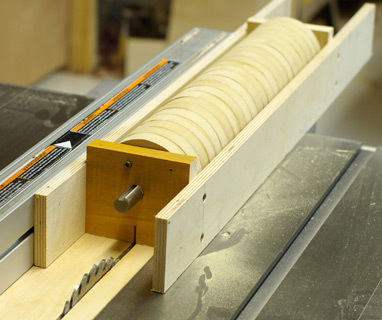 Rotate the drum again, this time so that the cut will be roughly centered between the first two cuts. You should be left with two narrow slivers which will snap off easily either with your fingers or a screwdriver. If you are using a thin kerf blade you may need to make a couple more passes, but less cutting means less MDF dust everywhere. Without removing the drum from the jig just yet, we need to predrill for #6 threaded inserts. I used 8 for the 18 inch version and 4 for the 9 inch. Centered in a disc, starting from the second disc and then every third disc after that. I marked the centers with an awl and did it with a hand held drill.